If you are a beginner in Python, there might be some problems with understanding certain Python constructs in the main text, you can read our tutorial. "You may not like the humor, but that is why every radio has an on-off button." Let's stick with the Beatles. George Harrison once said: "Gossip is the Devil's radio!" A radio button, sometimes called option button, is a graphical user interface element of Tkinter, which allows the user to choose (exactly) one of a predefined set of options. Radio buttons can contain text or images. The button can only display text in a single font. 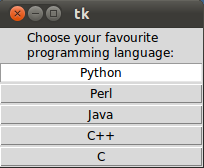 A Python function or method can be associated with a radio button. This function or method will be called, if you press this radio button. Radio buttons are named after the physical buttons used on old radios to select wave bands or preset radio stations. If such a button was pressed, other buttons would pop out, leaving the pressed button the only pushed in button. Each group of Radio button widgets has to be associated with the same variable. Pushing a button changes the value of this variable to a predefined certain value. In many cases, there are more than two radio buttons. It would be cumbersome, if we have to define and write down each button. The solution is shown in the following example. We have a list "languages", which contains the button texts and the corresponding values. We can use a for loop to create all the radio buttons. Instead of having radio buttons with circular holes containing white space, we can have radio buttons with the complete text in a box. We can do this by setting the indicatoron (stands for "indicator on") option to 0, which means that there will be no separate radio button indicator. The default is 1. We have added the option indicatoron and the option width.